We have always valued word of mouth recommendations rather than spin and clever marketing, in fact more than 8 in 10* or us trust recommendations of friends and families. But these days, with the power of the World Wide Web, online recommendations, good and bad play a huge part in most of our purchasing decisions. Having third party, peer recommendations is all part of your Social Proof – one of the biggest drivers for improving your profile. Recommendations also form an important ‘touch point’ for your business, a way that a potential customer encounters your brand and forms an opinion. Well, put simply, a good online presence provides credibility, this builds trust and this leads to greater loyalty and more sales. Good reviews send a strong signal that your business can be trusted and therefore minimise the risk involved for consumers making it much more likely that they will buy from you. Your own website and marketing material are important but they just don’t provide the same impact as third party reviews. Reviews will also help with search engine optimisation (SEO) efforts as Google and other search engines index reviews and use them for search results. Reviews of your business should therefore be embraced, not ignored because they have a huge impact on your reputation! If you have a website with a Google map on it, Google will probably already have a listing for your business that is gathering reviews whether you like it or not, so you may as well claim, manage and take control of your Google My Business account. It is particularly good if you serve a specific local area as it is geared to those that use a location in their search term, e.g. Marketing Services, Telford or Shropshire. To check if you have control just Google your own business name and location, e.g. Shop in the Square Wolverhampton and an entry should pop up bottom right. If is not claimed, click ‘Own this business’ and after some verification you can update your entry. You can enter key information, images or short posts, although these do expire after 90 days. 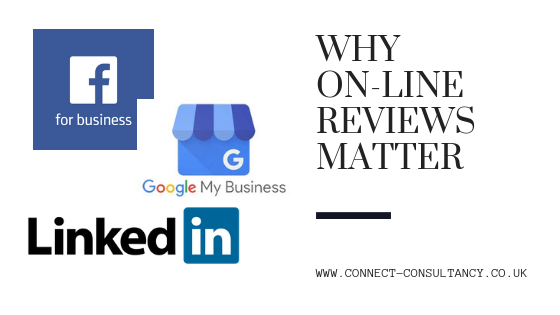 Whilst any positive online reviews are good, those left on your Google My Business page are without doubt the most important. These days, a Google review can have more impact than a Google Ad. So do a friend a favour and leave a Google review or two! Despite the changes to Facebook organic reach since January 2018, there are over 1 billion active users many of who are searching Facebook for businesses and looking for those all-important recommendations. Facebook are experimenting with moving away from Star Ratings in favour of a rating scale and if you mention a business you sometimes get a request to recommend that business with a simple yes/no button although you can add text and images. Or you can just go to the Facebook business page where you will find Reviews and Recommendations towards the top. Local or community Facebook groups are another great way to join in conversations and often people will ask for recommendations. You can select ‘Ask for Recommendation’ from the options below the text box, then if anyone that adds a link (which could be to your page) it will automatically go into the Recommendations area. Within the Recommendations section of any group (see menu on left) you can search by category and it will display those companies recommended by the group and how many times – great free advertising! LinkedIn is the number one platform for business to business connections, it’s the most professional of the social media platforms and third party recommendations are considered important to improve your profile and credibility. LinkedIn also says profiles with recommendations are 3 times more likely to get enquiries, particularly from outside your first degree contacts. Recommendations appear at the bottom of your profile, only two display, you have to click for the rest so I recommend you need at least two that are a year or less old. To give or ask for a recommendation, click the ‘More’ button under the name and select the Request or Recommend icons on the drop down menu. Follow the instructions. You need to give them clear instructions such as ‘If you liked my product/service please could you post a review on my Facebook site, on Google or LinkedIn’ – giving links and further clear instructions if needed. Don’t forget to act quickly, people are most responsive to giving a review whilst their experience is still fresh in their mind and ask for reviews on a regular basis so that your online reviews don’t look too dated. It goes without saying that you shouldn’t purchase reviews, pay people for them or submit multiple reviews from your office/home. Oh and don’t forget to thank your reviewers! It’s a fact of life that certain businesses will get negative reviews but if you have a lot of reviews the occasional not so good one can validate the others – so don’t fret too much. Most people realise that your business can have an off day and often an acknowledgement and apology is all that is needed to show that you care and are sincere in dealing with the issue. Check your reviews regularly and respond quickly to any negative ones. Apologise, stay calm, be friendly and polite in your response and then try to take any further discussion off line, out of public view. For very poor reviews, try to offer a solution whether that be a discount or just the chance to try the product or service again – but don’t offer bribe to remove review. If you do get some negative reviews, do try to make sure you have good reviews elsewhere so for example keep your website customer testimonials up to date and you can always ask people for more good reviews to counteract the negative ones. So in summary, people are talking about you whether you like it or not so check what people are saying and encourage more people to give you reviews. Reviews are great at convincing potential customers to choose you over your competitors and from their feedback also help you understand the needs of your customers and how you can improve your offering to meet their needs. This feedback also helps create a direct line of communication that allows you to monitor customer service and the perception of your brand. It’s hard to find a reason not to want to gather reviews. So if you want to drive your business to success now’s the time to give your reviews some attention.